Until I read the Ohio court order, I had no clue that the couple mentioned had been married on the same day and in the same state as I had been. I spoke with someone yesterday who had been following me on Twitter that day; coincidentally, he had also been following the Ohio couple, and thought that the two weddings were a part of some larger plan to converge on Maryland and get married. No, I assured him, that was not the case. We were spurred to be legally married by the DOMA decision. Until then, the religious commitment ceremony we had on May 1, 1982 had been sufficient. Of course, we’d done as much legally as we could have done. But on June 26, hearing that decision, we were determined to get the piece of paper that had so long eluded us. We settled on Maryland because a trip up the Eastern Shore was the quick, Maryland has no residency requirement but it does have a two-day waiting period so initially, we planned for two trips up. (We have 2 old cats that require medicine.) Once I found out about Maryland’s nonresident application, I set out to get it completed and mailed in. One small problem: the application has to be completed by someone authorized to issue marriage licenses in your state of residence. In Virginia, that is only the Clerk of Court. As i worked my way through the process, I discovered that not all Maryland counties work the same way. At least one would allow the form to be notarized, instead of being completed, as the official form states, by someone authorized to issue marriage licenses. A call to the clerk’s office in Worcester, where we wanted to go, wouldn’t allow that option. So I started making calls, trying to find a clerk willing to complete the nonresident application. Understand: what is on this application is nothing but personal information – name, address, date of birth, place of birth and information about previous marriages, if any. With Virginia’s ban on marriage equality, it was a tough sell. But ultimately, the clerk in Norfolk, George Schaefer, came up with a possible solution: a Personal Affidavit that contained the exact same information as the nonresident application. I agreed to give it a shot. On July 3, my partner and I went to Schaefer’s office, presented our identification, and got the completed Personal Affidavit. I put it in the mail the same day. Imagine my surprise when Monday, July 8, as I was cutting grass, my mailman came up to me with a big grin and a hearty congratulations, along with a large white envelope. Inside – and showing through – was the marriage license. The affidavit had worked! I came inside and called Maryland and arranged the ceremony for Thursday at 2pm. Yes, it’s possible to put together a wedding in a couple of days 🙂 My former co-worker and good friend, Carol, not only accompanied us and took pictures, but also drove us up and back. The people in the clerk’s office in Worcester were wonderful, as I had been told they would be. And the clerk, Stephen Hales, was absolutely awesome. As it was two weeks ago when I announced “it’s official!” on Twitter and Facebook, my column yesterday elicited nearly universal positive responses – and I’m ignoring the two negative ones 🙂 The treatment is in stark contrast to what I received as a candidate in 2005 and proof of how far we’ve all come in eight years. 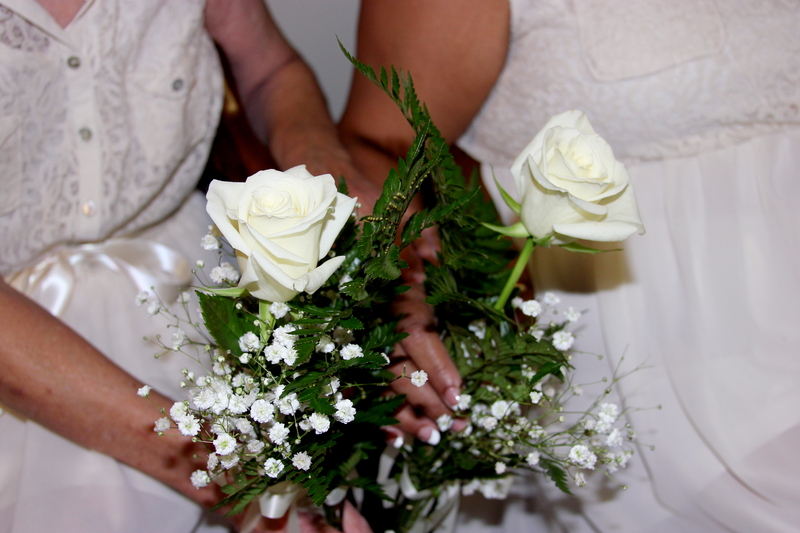 Nonresident applications are done on a county-by county basis, so make sure you have the right application for the county in which you plan to marry. The license is good only for that county. Check with the clerk in the county in which you plan to marry to find out what they are willing to accept. If they require their specific form to be completed by an official who is authorized to issue marriage licenses, you are going to have to find one willing to complete it. In Virginia, only Clerks of Court are authorized to issue marriage licenses. If you are planning to marry in Worcester, the Norfolk Clerk of Court’s office is willing to complete a Personal Affidavit in lieu of the nonresident marriage license affidavit (pdf) and the Clerk of Court in Worcester is willing to accept it. The fee for the personal affidavit $12. Congratulations! We have bigger battles in life to fight then who loves whom which is a personal matter. I find it sad that my State of Virginia is so far behind our neighboring State of Maryland. Maybe someday everyone will understand that marriage should be for anyone that wishes to enter into it. This was a really nice way to start my Saturday. Congratulations.